This uni-cast modular, polyethylene unit is without question the most economical and environmentally sound choice for individuals and companies spraying glazes or anything else. This polyethylene booth has no seams, making it a breeze to clean, and it won't rust, corrode, or discolor. Overspray is "funneled" into your recovery tank, saving valuable material while protecting the environment. The 42" W × 39" H front opening and 30¼" depth provide a spacious work area. Outside dimensions are 55½" H × 48¼" W × 50¼" D (including the exhaust motor mount on the back). ¾ HP Exhaust Fan. Inside dimensions are 39" H × 47" W × 30¼" D. The leg assembly measures 74¼" (with legs). Shipping weight is 195 lbs. 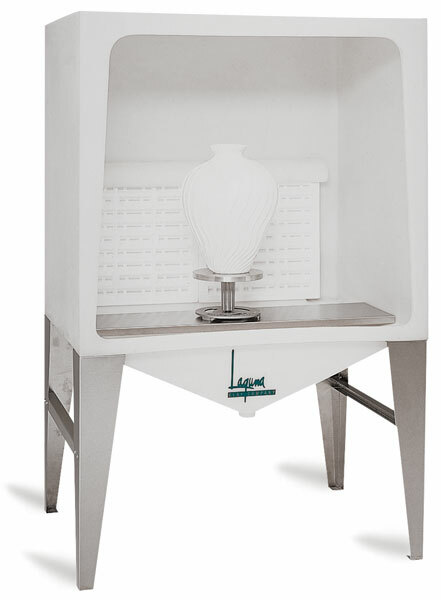 To view a PDF of the Owner's Manual for the Laguna Pro-V Seamless Spray Booth, please click here.